Poor oral hygiene can lead to a build-up of plaque and tartar on your teeth. When this happens, the bacteria can cause the gums to become red, sore and inflammed (swollen). 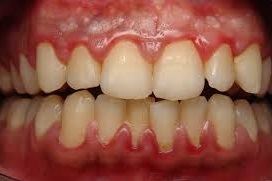 If gum disease is not treated and the plaque and tartar continue to buildup, you may develop periodontitis. The aim of treatment for gum disease is to remove the cause i.e. plaque. Treatment is aimed at the reduction of oral bacteria, and may take the form of regular trips to the dentist or dental hygienist together with adequate oral hygiene home care. Have your teeth cleaned by the dentist every 6 months. See the hygienist every 3 months if necessary. Brush your teeth for 2 full minutes twice a day. Floss your teeth every night.